Architectonical artefacts are in many ways one of the most extraordinary legacies that past civilizations have left to us from a cultural, technological and functional standpoint, because of the impact that the development of the material culture and building techniques had for ancient communities. The definition of a protocol designed to achieve an understanding of the object of Cultural Heritage consents the realization of various models. These models are the bases for all the critical, selective, specialist next analyses and elaboration. This work discusses the possibilities offered by the integration of heterogeneous method, traditional and innovative, for massive surveying and digital representation technologies. Speaking about architectural survey for the process of data gathering means penetrating the most dynamic fields of research, particularly because of the close relation that links the discipline with the technological development. The relationship between direct collection of information and the appliance of software and hardware devices help us to record the undergoing changes of the survey in an important moment of revision, from a traditional approach to one intimately connected with the huge potential provided by digital technologies. The integration of the traditional approach with the continuous technological advancement and in particular the great digital revolution provide new research tools that are easily applied to science. In the field of survey and representation, like in many other disciplines where it is necessary to gather data, the introduction of new information technologies has quickly revolutionized the way we understand and address the matter. Even though the fundamentals of the existing disciplines haven’t changed, they have been interacting with new tools and applications for a long time now. The survey as well as technological advancements led to the development of three different areas of research: the first deals with data collection (nowadays they are able to provide, in a short time, a large amount of information with a high degree of detail); the second area is more restricted because it is addressed to research and suggests new low cost solutions; the third concerns the traditional methods and their integration with the former two. The survey operation, as a process involving deep knowledge, aims at the accurate representation of the analysed subject and its goal goes beyond the consideration of the technique and the specific instrument, making the ultimate result of this process broader and more amplified (Docci, Bianchini, & Ippolito, 2011). It’s not appropriate to focus the attention on a specific technique only but to the integrate all different techniques, tools and methodologies, in order to achieve the best interpretation of the analysed subject. For this reason, drafting a procedure based on the interaction between direct and indirect high cost and low cost methodologies for the elaboration of 2D and 3D models would be a topic of great interest. This study aims to suggest a modus operandi for the standardization and regulation of data collection, processing and recovery procedures, in order to make the final scientific results more objective and correct. All of these considerations make it clear that the problem must be addressed as a whole, by designing, testing and applying innovative management tools able to deal case by case with the complex issues we have outlined. Such tools, however, cannot achieve their full potential without a substantial change in perspective: architecture cannot and must not be regarded as an isolated entity but as part of a larger “cultural cluster”. Obviously, this implies the necessity of broader management and the application of different skills of architects, archaeologists, restoration specialists, administrators, informatics scientists. People involved at all levels of organizing the operation and in many other capacities will all be called upon to address the problem, material and cultural. 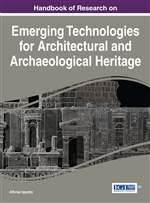 This work discusses the possibilities offered by the integration of heterogeneous method, traditional and innovative, for massive surveying and digital representation technologies. The forward examples aim at proposing some possible guidelines derived from the activities carried out in the last years of my research within the Department of History, Drawing and Restoration of Architecture of Sapienza University of Rome. The main aim is to discuss the advantages of a non-contact digital-catching in the reconstruction of architectonical and archaeological contexts which have undergone substantial transformation, such as the case of San Peter’s Dome and the Divo Claudio’s temple in Rome. The second aim is to discuss the advantages of digital catching during the phase of documentation and analyses of the architectonic and archaeological artefacts. 2D Model: Drawings which are conventionally represented elements constructed of architectural and archaeological nature at different scales of representation, consisting of plans, elevations and sections. In order to communicate all the knowledge acquired about the surveyed object, two types of model can be made: geometric models and textured models. The first typology of model is characterized by the geometrization of the elements represented and show the morphology and the spatiality of the object; the second one make explicit the actual configuration of the elements and show characterization graphic indicating the quality of the surfaces and their state of preservation. Representation: The process by which percetions, imaginations, judgments and concepts are presented to awareness and the object that is represented in this way. Numerical Model: Synthetization of survey datum in which is registered every single information acquired be it metric or chromatic. The term refers to a model whose shape is described by points characterized by their spatial coordinates x,y,z, also known as point clouds characterized by greater speed in the phases of acquisition and elaboration of data. 3d Survey: Process that involves the passage from the real object to its representation, which leads to the definition of graphic models through a cultural process aimed at a critical reading of the object and its description 3D and 2D models, able to describe the object to the appropriate scale of representation. 3d Surveying: Knowledge system which includes the steps of acquition data with the aim to obtain the maximum objectivity. The techniques for the 3D survey are linked to non-contact survey, which have the aim to return the rappresentation of a real object in a virtual three-dimensional space. Nowaday the methods of highly specialized 3D survey, as 3D laser scanner short range and long rang, comparing with those speditive one, as the photomodelling, image-based methodology characterized by greater speed in the phases of acquisition and elaboration of data. Textured Model: Model obtained with techniques based on the digital development of images, use texture mapping to define in detail the formal aspect and the state of conservation of the organism, making a continuous exchange between the represented object and the observer, a two-way relationship between iconic representation and virtualization of the surveyed object. Textured models are suitable for general users, since they close resemble reality, and for expert users, because the photo is linked to metric information. 3D Model: Communication tool for the understanding and support of the object based on the three-dimensional representation of a real object in a virtual space. Depending on the objective for which they are created,two types of model can be made: figurative 3d models and 3d models for scientific purposes. The figurative 3d models are aimed at convincing documentation of reality with a purely informative purpose; they are characterized by the identification of the geometry that describes the object represented by the clear and readability of its component parts. The 3d models for scientific purposes have a higher dimensional and formal correspondence with the real object and are characterized by high accuracy and reliability of the dimensions represented. In the first case, any survey's methodology is able to obtain data necessary for a correct realization of the final model, while in the second one needs to have qualitative accurate and highly precise survey data.